About 5 years ago, I rescued 2 chins from a hoarding situation. They were a bonded pair (male and female). However my male (Kustard) had a lot of health issues including chewing his tail and we had to get him euthanized last night due to gut stasis. My female(Plum) is generally a very active little chin but she lost her partner and now she’s extremely depressed. I have another male (Bubbi) in a separate cage that I’ve considered getting neutered and introducing the two of them so she still has a cuddle partner. I’m just very heartbroken and grasping at straws at this point. I don't advise getting the other male neutered, for a couple main reasons. The first being not all chins like all other chins, so you could put the male through that whole ordeal for nothing. It's not advisable to allow the male and female to be together even just to see if they get along, mating takes seconds, faster then you can stop them. Also even previously bonded pairs can have the bond broken in the time it takes the male to heal from neutering. Second I don't know if you had the previous male neutered or he came to you neutered but neutering is not that safe for chins. They can die being prepped for surgery, during surgery, or have post surgery complications and die. You will have to keep him separate from the female for 12 weeks to make sure he is fully healed and all the sperm is out of his system. That is assuming nothing goes wrong, it's not uncommon for you to need to hand fed him do to pain, as well as watch him pretty much 24/7 for the first couple weeks at least to make sure he leaves the area alone. It's not a simple surgery like it is for cats and dogs, the testicles are internal so it's more like a spay then a neutering. A much better idea is to get the female a cuddle buddy, which is just a chinchilla shaped fleece toy. 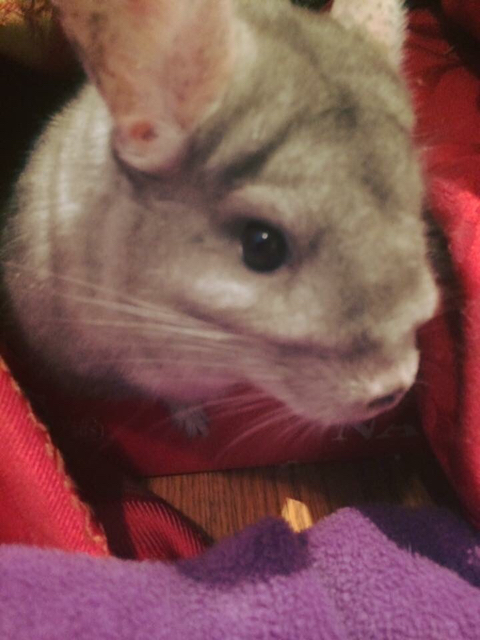 https://www.etsy.com/listing/7945955...chillas-pocket Or if you want another chin, get another female to try to bond with Plum instead, then you don't have to worry about risking your other chin's life neutering him. Chins do grieve though, and it can kill them (they stop eating and drinking, don't move around enough, etc) so make sure you give her lots of extra attention and make sure she is eating and drinking enough. If she is too depressed to eat (keep an eye on her weight and watch for loss) you may have to encourage her to eat or hand feed her until she is feeling better again. You can also try putting some new toys in the cage, or at least rearrange the cage so it's new looking to get her mind focused on other things. I wouldn't neuter a chinchilla. I've had rabbits and guinea pigs neutered as well as other surgeries but chinchillas stress so easily, obsess over wounds or stitches easily, and have a high risk of GI problems both from antibiotics and from not eating as well due to discomfort or stress. I'd consider surgery of any kind as a last resort for reasons beyond cost when it comes to chinchillas. I'd cage them near each other but be careful of shared wire walls. I know other species such as rabbits have managed to mate through wire dividers. Sometimes seeing other animals going about their routine is extremely helpful. It doesn't even have to be the same species to have an effect. 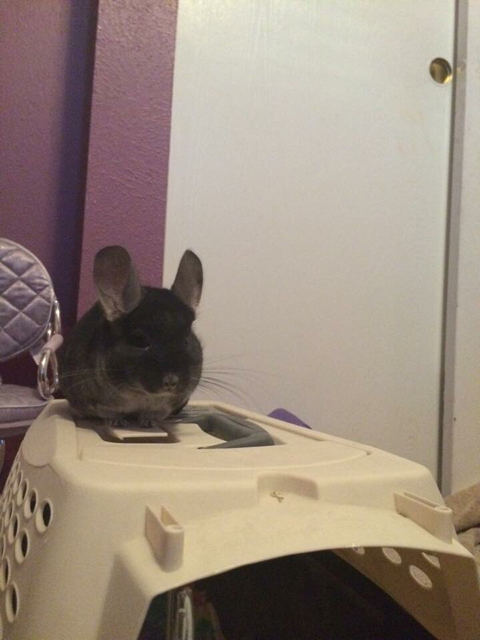 Although a similar size and behavior is usually better but humans and other animals appears to be the preferred version of tv for chinchillas here. Maybe not the 6' bull snakes in the livingroom display tank. They seem to just not understand the existence of those and quickly dismiss them. Make sure she has plenty to see and do. Some chinchillas like it quieter than others so you have to adjust for that but they can benefit more from a bit of noise rather than a risk of loneliness. The idea of keeping things calm and quiet to not increase stress for grieving humans doesn't work with animals. They do better if their mind is kept busy and a new routine is established right away. I'd be running the tv or youtube vids on the computer. Doesn't matter too much what it is but mine dislike silent nothingness. The water bottle springs start getting creatively dismantled and a wood house or 2 may suddenly lose a wall or roof if we sit around quietly a lot while home. Give lots of tasty chewy objects and hay for entertainment and to keep her eating. Maybe pick up some fresh sticks and a less common hay. Oxbow has some herb added botanical hay and meadow hay that make good treats or a few handfuls of good quality oat hay (not fully mature oat straw) is often enjoyed.